This is the first installment of a multi-part series looking at what I consider to be the middle child of the Souverän family, the M600. This first post will explore the history, features, and variations of the M600. In a follow-up post, I will be reviewing both the old and new style M600 pens in a head to head match-up. 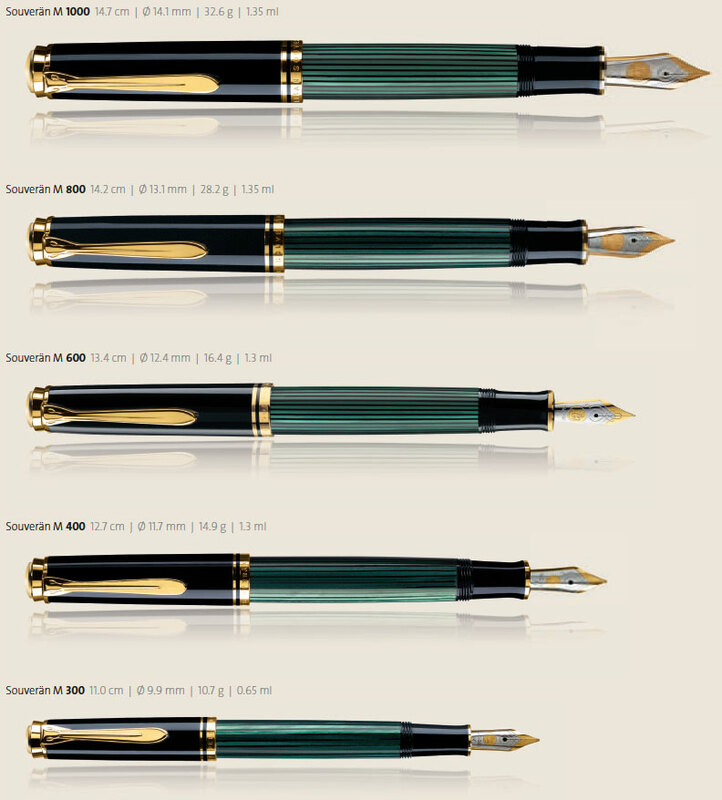 The M600 has one of the more interesting histories amongst Pelikan’s Souverän line-up and therefore is also prone to generate confusion amongst collectors. 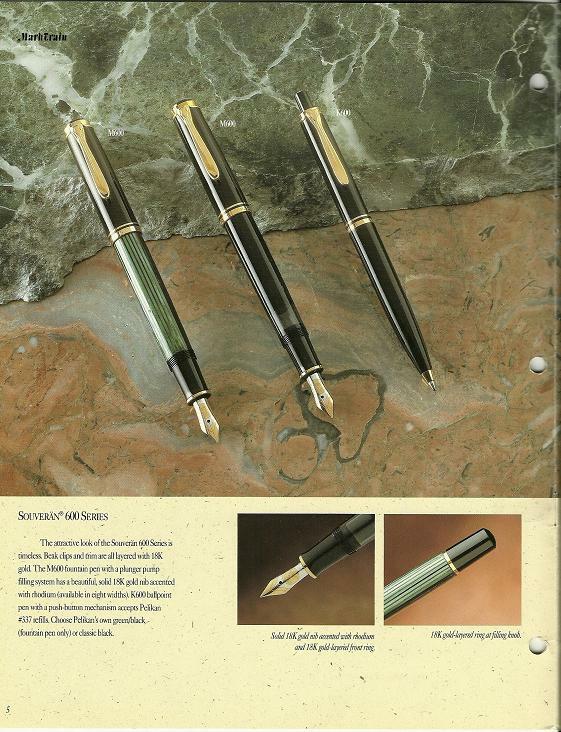 As I’ve described previously, the year 1997 saw many changes to the trim styles of both the Souverän and Tradition series of pens. Perhaps no pen was more affected than the M600 because not only did the trim change, the actual physical dimensions of the pen did as well. The M600 was originally introduced in 1985, a few years after the M400 was debuted. At that time, it had the same exact dimensions as the M400 but included an upgraded trim package. The initially available barrel colors included black (1985), burgundy (1989), and the familiar green striated (1990) variations. A tortoise version also exist but these are much less frequently encountered due to its limited production run. 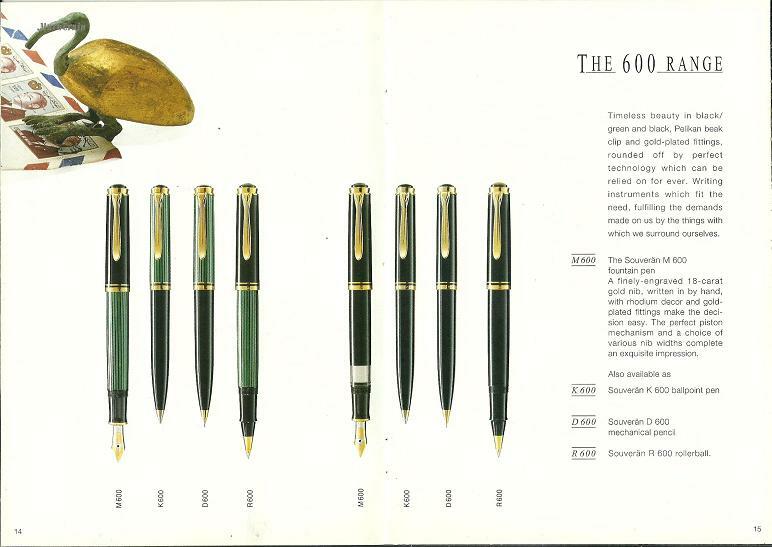 During the M600’s first few years (1985-88), it was included with a monotone 18C-750 gold nib. 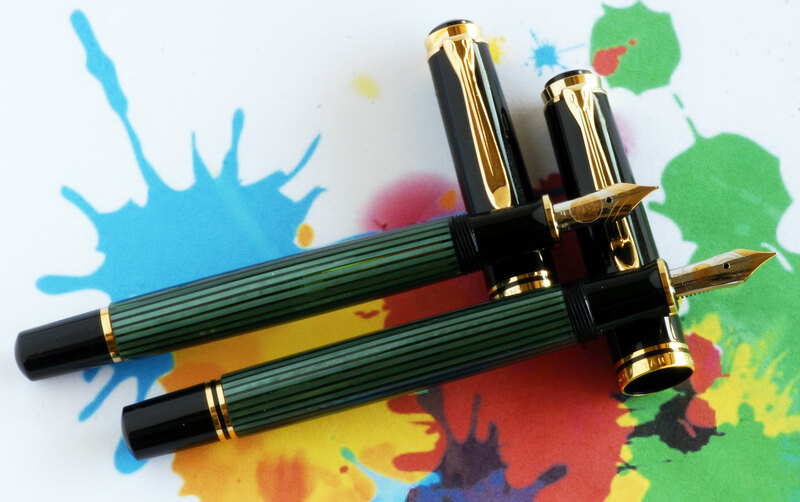 In 1989, a two-toned 14C-585 nib was employed. Finally, in 1990, Pelikan settled on a two toned 18C-750 nib which was utilized until the trim change (1990-1997) at which point they returned to the 14C-585 two-toned nibs for all but their special editions. It should be noted that many of the older 18C-750 nibs have the PF and E|N hallmarks depending on the market to which they were destined. When the trim styles changed in 1997, Pelikan opted to also adjust the physical size of the M600 in order to bring it more in line with the size increase inherent in the line-up as you progressed from the M400 through the then newly introduced M1000. The total length of the pen was increased as well as the diameter of the barrel, fitting it as far as size goes squarely in-between the M400 and the M800. Since that time it has held an interesting spot in the line-up, being that in-between option size wise but also having the lighter feeling of the M400 owing to its lack of the brass piston assembly found on the larger models. Old-Style, Pre-1997 M600: This model was released in 1985 and is most commonly found in black, burgundy, and green striated variations (a tortoise models exist but is much rarer). The cap is black on these the more common black and green striated pens with a black piston knob and section. There are two cap bands, a trim ring at the section, and a thicker trim ring at the piston knob. Some of the pens manufactured before the re-unification will have “W.-Germany” engraved on the cap band. The furniture is gold-plated and the cap top has an etched two chick logo. The barrel exhibits transparency to allow the ink level to be viewed on the striated model whereas an ink window serves this purpose on the solid colored models. The nib, if original, can be used to date the pen. 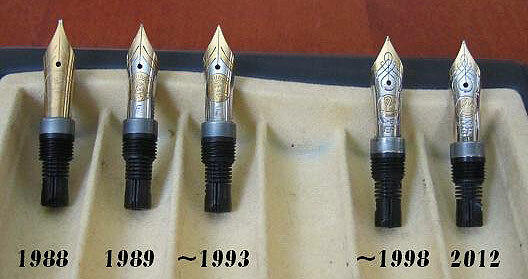 They are all “logo” nibs which were 18C-750 monotone gold from 1985-1988, 14C-585 two-tone gold in 1989, and 18C-750 two-tone gold from 1990 until the pen’s design was changed in 1997. These pens have the same dimensions as the M400 as depicted in the table above. The ink capacity is approximately 1.30 mL. New-Style, Post-1997 M600: This model was released in 1997. It’s chassis has been used to launch multiple special editions such as the M620 Cities series and the M640 Beauty of Nature series as well as others. The M600 itself has commonly been available in black, green striated, blue striated, and red striated. Amongst those more common color variations, the piston knob, section, and cap are black in color. There are two cap bands, a trim ring at the section, and two trim rings at the piston knob. The furniture is gold-plated. The cap top has a painted two chick logo from 1997-2003, a one chick logo from 2003-2010, and a 24K plated one chick logo cap top from 2010 to present. The nib depicts the Pelikan logo and is a two-tone 14C-585 gold (special editions more commonly have 18C-750 nibs). The barrel exhibits transparency to allow the ink level to be viewed on the striated variations. As noted above, the dimensions of the pen are larger, placing it squarely between the M400 and M800 in the Souverän family. The ink capacity is approximately 1.37 mL. Both of the M600’s feature a friction fitted piston assembly. It is not until you step up to the M800 that you begin to find a threaded assembly. While this is not usually an issue, I have seen reports of the piston knob becoming loose as the assembly has inadvertently backed out of the barrel. For more information about loose piston knobs, see my prior post on that topic. Once the M600 was redesigned, it became a platform for the release of many special and limited editions based off of the chassis. The M640 is one of these special editions in the M6xx family but actually is a significant departure in design from the other models in the 600 family and so I’ll be reviewing and discussing it separately in the final post of this series. A list of all of the various models that have been included in the M600 series over the years will be shown at the end of this post. All told, there have been 41 different variations released in the M6xx series over its 26 year existence. * Limited edition of 3500 pieces produced for Sony Malaysia in 2001. Equipped with an 14C-585 two-tone gold nib. § All of the above pens are distinguished by rhodium rather than gold-plated furniture. § All of the above pens have 18C-750 gold nibs. Color schemes vary based on the edition. The M640 series notably is without an ink view window and has a barrel which bulges in the middle, a design not found on other pens in the M6xx series. § All of the above pens have 18C-750 gold nibs. The M625 series has silver piston knobs. Thanks! I very much favor the M6xx variations but agree that the M640 is a big departure from the standard design, even for a limited edition model. Still, it has some merits on its own which I’ll be reviewing a little later. The middle child, I like that, a little more respectful than my ‘red headed stepchild’ attribution. Among new fans and collectors alike it seems that the M600 is often overlooked. For me it is the Goldilocks of Pelikan sizes, not too big, not too small, just right. Your article illustrates a fact I knew but not properly appreciate: The great number of variants based on the M600 chassis. Years ago I had an M640 Polar Lights, one of the best looking pens ever made by Pelikan in my opinion, but I found that bulging barrel to be uncomfortable during longer writings sessions, so let it go to another fan. Nice Job on this Joshua, however there is a down side to this article: You’ve rekindled my interest in the pre 97 Burgundy model. I did not appreciate the large number of variants in the M6xx family myself before researching this article. The M640 seems to be the biggest departure in the family in terms of styling and therefore doesn’t always ring true for everybody. The burgundy M600 is a beauty. Good luck tracking one down. Joshua; as usual, a great discussion on the M600 with excellent pictures and catalog information. Pelikan should hire you as their chief Librarian. Thank you for the kind words Francis. Thank you for your comment and I’m glad that my post was useful to you. Value is a subjective thing and dependent on so many variables. For the old style M600, the type of nib can definitely have an impact on sale price. A good resource is the “sold listings” feature on eBay. That will give you an idea of what similiar examples have recently sold for at auction. In general, I see old style M600’s range in price form $150-300, some going for more in certain circumstances. I think the sweet spot, at least at this time, is in the neighborhood of $200-225. I hope that helps you. Take care.